The Night Swimmer, Matt Bondurant’s utterly riveting modern gothic novel of marriage and belonging, confirms his gift for storytelling that transports and enthralls. In a small town on the southern coast of Ireland, an isolated place only frequented by fishermen and the occasional group of bird-watchers, Fred and Elly Bulkington, newly arrived from Vermont having won a pub in a contest, encounter a wild, strange land shaped by the pounding storms of the North Atlantic, as well as the native resistance to strangers. As Fred revels in the life of a new pubowner, Elly takes the ferry out to a nearby island where anyone not born there is called a “blow-in.” To the disbelief of the locals, Elly devotes herself to open-water swimming, pushing herself to the limit and crossing unseen boundaries that drive her into the heart of the island’s troubles—the mysterious tragedy that shrouds its inhabitants and the dangerous feud between an enigmatic farmer and a powerful clan that has no use for outsiders. The poignant unraveling of a marriage, the fierce beauty of the natural world, the mysterious power of Irish lore, and the gripping story of strangers in a strange land rife with intrigue and violence—The Night Swimmer is a novel of myriad enchantments by a writer of extraordinary talent. 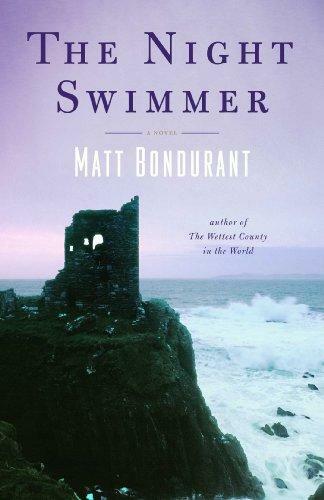 Matt Bondurant‘s new novel The Night Swimmer will be published in January, 2012. His second novel The Wettest County in the World was a New York Times Editor’s Pick, and San Francisco Chronicle Best 50 Books of the Year. His first novel The Third Translation was an international bestseller, translated into 14 languages worldwide. A former John Gardner Fellow in Fiction at Bread Loaf, Kingsbury Fellow at Florida State, and Walter E. Dakin Fellow at Sewanee, Matt’s short fiction has been published in journals such as Prairie Schooner, The New England Review, and Glimmer Train, and he has recently held residencies at Yaddo and the MacDowell Colony. He currently lives in Texas.